In this video, the second in a seven part series on osteoporosis exercises, I discuss why a kyphotic posture could lead to health problems, how to avoid a kyphotic posture, and kyphosis exercises to avoid. If you have not signed up for the rest of the lessons, you can sign up for this free email course at the end of this blog post. This video tutorial identifies the unsafe movements that could lead to a vertebral fracture if you have osteoporosis, osteopenia or low bone density. I start with a discussion of bone mass, how it changes during your lifetime, and when you can expect your bone mass to peak and then decline. Regular exercise can ‘level off’ this decline and could actually increase your bone mass over time. But there are other exercise and movement strategies you should consider to avoid the onset and development of a kyphotic posture. If you have osteoporosis, osteopenia or low bone density, you need to avoid exercises and movements that put you in flexion as these movements increase your chance of vertebral fractures. I describe each of these kyphosis exercises to avoid in my book, Exercise for Better Bones. I have written a detailed blog article on Osteoporosis Exercise Contraindications (commonly known as kyphosis exercises to avoid or osteoporosis exercises to avoid). In total, I have identified fifteen exercises for kyphosis in Exercise for Better Bones. We have two types of bone: trabecular and cortical. The trabecular bone is the weaker of the two. Unfortunately, the inside of the vertebral body of the spine is largely composed of trabecular body and, as a result, is most at risk of fracture. Once you have one fracture, your risk of another fracture increases. The key for you is to reduce your risk of that first fracture. I recommend that you perform extension exercises to counter the risk of a fracture. I cover these exercises extensively in Exercise for Better Bones. Today’s tutorial is going to cover ‘Stop the Stoop’ and what are some of the unsafe movements that can lead to fractures of your vertebrae if you have low bone density or osteoporosis. These are frequently referred to as kyphosis exercises to avoid and they can lead to compression fractures. Many of you have most likely read or heard that you reach peak bone mass somewhere in between the ages of 25 and 30 years of age. Then, all things being equal, as you continue to age women tend to lose bone at a faster rate than men do because of the loss of estrogen that occurs with menopause. When you start to incorporate regular, healthy vigorous exercise you can start levelling off and sometimes even increasing your bone mass. We won’t have time in today’s tutorial to go into the intricacies of why compression fractures happen. There is a much more detailed tutorial on the website, How to Treat a Compression Fracture. However, you should know that certain movements, especially movements of flexion; movements that bring you into a rounded back: sit-ups, toe-touches, all of these types of motions, have been shown in studies going back to 1984 that they will greatly increase your risk of vertebral fractures. 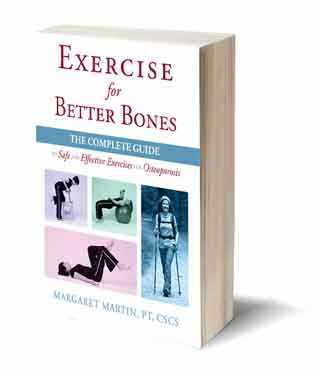 In my book Exercise for Better Bones, I have a whole section committed to safe movements that you can incorporate into your activities of daily living as well as your exercise routine. I also identify specific movements you should avoid. In my book Yoga for Better Bones, I identify (for both yoga practitioners and instructors) the yoga poses that require modification and those that should be avoided for people with osteoporosis. We have two types of bone in our body: cortical bone and trabecular bone, and it is shown that the inside of the vertebral body of the spine has a much higher percentage of trabecular bone than most other parts of your body. Your mid-back is a location that much more vulnerable than other bones in your body when you’re imposing unsafe forces to it. Once you have one compression fracture, the forces in your spine — above and below the fracture site — actually start to change. This change leads to a much higher risk for a second, third and fourth compression fracture. The key is to prevent your first compression fracture. If you’re listening to this and you’ve already had a vertebral fracture or compression fracture, all hope is not lost because studies show that by doing safe and effective extension exercises — where you’re building the muscles of your spine — will greatly reduce the rate of second and third fracture. When Should You Start Exercise After a Compression Fracture? Another important consideration if you have have had a compression fracture is when to start exercising after the compression fracture. I cannot go into this in detail in the blog post because every patient’s medical situation is unique. But bear in mind that the timing of your recovery exercise is important. You do not want to start too early since healing time is an absolute requirement. I work carefully with both my patient and their physician to determine when they can start exercise again and what specific exercises are best suited to the patient’s situation. My advice to anyone with a compression fracture is make sure you work with and experienced and skilled Physical Therapist. I mentioned earlier that unsafe exercises can cause fractures of the spine. But it’s not just exercises that we need to be concerned about, it’s all of the activities that you do day in and day out. How you lift up your grandchild, how you feed your dog, how you pick up your groceries — all of those movements can cause microtrauma to your spine, or not. Learning to move with safe body mechanics is an important part of the Exercise for Better Bones program and these are covered in the Activities of Daily Living section of the book. We provide hundreds of examples from working in your kitchen, making your bed, picking up your grandchildren, feeding the dog … that gives you tips and ideas to start incorporating into your day to day life. In tomorrow’s tutorial, we’re going to look at the key principles that are needed when you’re looking at a bone building exercise program. Look forward to seeing you then. Are you interested in your own Physiotherapy Posture Correction Program to address your kyphosis? You can work with me on a one-on-one basis and receive your own Posture Alignment Therapy. 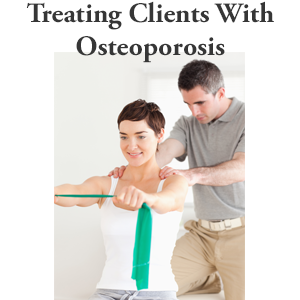 If you happen upon this blog article without signing up for my free email course on osteoporosis and exercise, welcome! If you haven’t already subscribed to the free email course, you can sign up here for the seven lesson free course: Exercise Recommendations for Osteoporosis. In this discussion we covered a number of topics related to kyphosis exercises to avoid. Hopefully you feel more knowledgeable about the topic. You learned about the kyphosis posture and how to avoid it, and we listed kyphosis exercises to avoid and in a related blog post covered osteoporosis exercise contraindications. Tomorrow’s lesson will cover the four key exercise principles of an osteoporosis exercise program. Stay tuned! I find your tutorials most helpful but have to keep going back to the original webset. I have left my email as I am very keen to do what I can to help myself. It helps so much when you know more about the way the body walks and I find your talks easy to understand. I once again give my name and email address and hope to hear from you on. A regular basis. I have signed up for online tutorials, have received the introduction. Have received the Stop the Stoop BUT NO VIDEO ATTACHED? Hi Lisa: the video is embedded in the blog. I do not see the video showing the correct exercises, I see only the video with Ms Martin speaking? 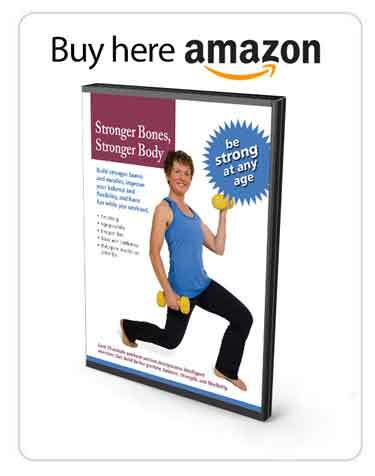 Hi Linda: Thank you for purchasing Exercise for Better Bones and congratulations on committing to the health of your bones. The Activities of Daily Living Guide is not in the book. It is available on our site for free as a PDF. 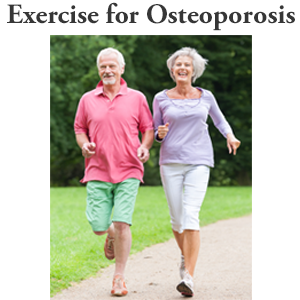 The link to get the PDF is noted in Exercise for Better Bones. I will send you an email with the link since you have not found it in the printed book. Be on the look out for an email from me. My apologies for the confusion. I went to my lap top and to my browser and now I got the video. 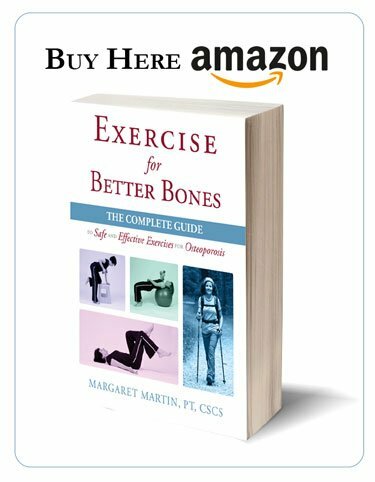 🙂 …Also, I ordered the book, Exercise for Better Bones. Thanks! Hey i am 16 year old kid and i want to grow my height so can you help me out for it . I request you to tell some exercise and diet for me. I am 66 with bad osteoporosis and ga e been put on prolia. Had pain after the second shot and have chronic sinusitis which prolia seemed to make worse. I really don’t want to take the third shot what would you recommend ?